1. High shock & vibration resistant. 4. Instant start, no noise, no flickering. 5. Suitable for both indoor and outdoor use. the quality such as: CE,RoHS,SAA,C-tick,TUV,UL,CSA approved (file No.254687) . 1. Shenzhen DANS Opto-Electronic Technology Co., Ltd with more than 7-year experience in this field. 2. Super brightness, low decay high quality. 3. No flicker, no mercury, eco-friendly. 4. High quality with competitive price & excellent after-sale services. 5. Free samples & freight charge available. 7. Long lifespan 50000 hours(average) with 5-year warranty. 8. SAA CE RoHS approved. 10. Variety of products: LED bulb lights, LED down lights, LED spotlights, LED tubes & LED street lamps, etc. 3.OEM&ODM, we can help you to design and put into product. 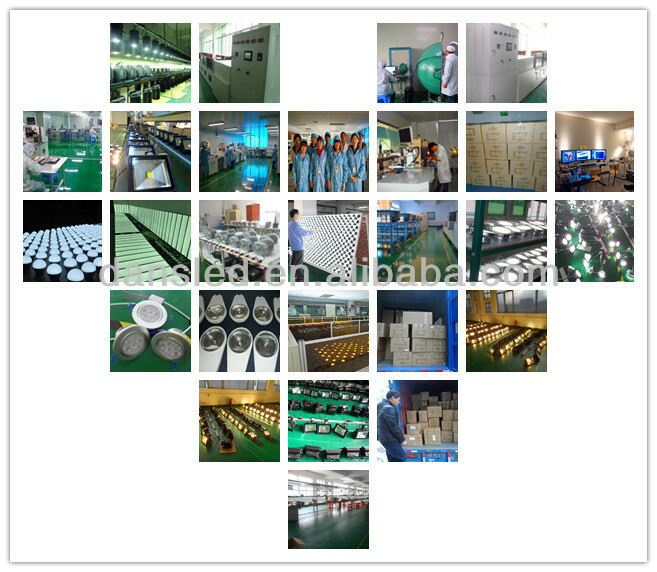 technical support and service of LED semiconductor illumination products. capacity of 1,000,000 pieces of LED lights. YES, we are professional manufacturer in lighting business for over 5 years. Our factory located in Shenzhen City, Guangdong province. 3. Do you do OEM, can I apply my brand to print in the product? suitable color box and outer box design for you! 4. Can I visit your factory to check? Which international exhibition you will be this year? this year, we shall be in Autumn Canton Fair & HK lighting exhibition, thanks for attention! 5. What's your warranty on products? We accept L/C at sight, TT , etc. 7. Where is your delivery Sea Port?